A boat tour around Capri is one of the best ways to discover Italy's most beautiful island from Sorrento, especially in the high summer season when the ferries are full and the island is hot and crowded with tourists. Private boat rental without skipper: for smaller boats, a boating license is not required, though some experience at sea is recommended. Remember that you will not be able to dock at the port to visit the island by foot, however. Departure ports: departures are usually from Sorrento around 10 am, but there are also tours which depart from Piano di Sorrento and Massa Lubrense. Prices vary depending upon the type of tour you have chosen. Prices begin at an average of EUR 30 per person for a mini-cruise and can cost up to EUR 500 to rent a spacious private boat with skipper. The best quality/price option is usually a group gozzo boat tour which includes beverages and snacks, which cost around EUR 80 per person, which is about the same amount you would spend for a private tour of Capri. Full day boat rentals without a skipper cost around EUR 200 - 350, depending upon the type of boat. You will sail along the Sorrentine Peninsula to Punta Campanella, the furthest point before heading to open sea and the island of Capri. You'll first reach Tiberius' Leap, the western point of the island topped by Villa Jovis. 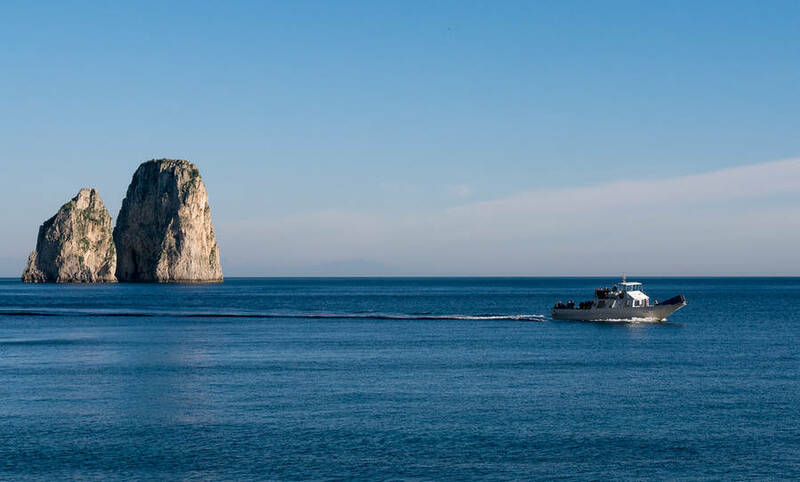 Your tour around the island begins here, passing the Faraglioni sea stacks and stopping at Marina Piccola where you can usually dock and visit the town of Capri and its famous Piazzetta by foot. After a few hours of free time, you can set sail for the stunning coastal coves for a short swim and a visit to the Blue Grotto before returning to Sorrento in late afternoon.